Roll Call: Aquaman, Martian Manhunter, Elongated Man, Zatanna, Vibe, Steel, Vixen, and Gypsy. In Detroit, the Justice League has seen better days. In addition to being defeated by the mystic Felix Faust and his minions, there is tension between Steel and Aquaman. Steel feels Arthur doesn't think many of the new members are good enough for the team. A boy in a Superman T-shirt stops them before their conflict gets worse. After all, they are supposed to be heroes. How can they help save the world if they cannot aid each other in a moment of crisis such as this? Right now, the Justice League needs a plan if they are to defeat their nemesis whose magical creatures are trying to rid the universe of them. Ten hours earlier, the JLA is outside of the Bunker, their Detroit headquarters, giving a tour to the local school children in an effort to be a part of the community. All seems well. However, Martian Manhunter feels uneasy. He is right to be this way, for Felix Faust knows that both the time and place are correct for what he must do. The ancient Tablet of Tel El-Amarna, which is written in a language long forgotten, aids him in his evil plot as he reads its words aloud. Smoke swirls and engulfs the city's homeless, using the darkest elements of human nature to turn them into monstrous creatures. Now, with an army of demons at his command, it's just a matter of time before Felix Faust can exact his revenge on his foes the Justice League. The tour is not going well for the Justice League. A boy named Lamont wants Superman, Batman and other "more important" members. Another lad says that the JLA isn't about who is in it. It's the idea that's important. Zatanna takes that moment to prepare a magic trick for the kids. Suddenly, Felix Faust and his demonic army attacks. The battle is heated. Martian Manhunter and Aquaman are taken out as Vixen and Zatanna try to buy some time while the rest of the team take the children to the medical lab. Once its vault door is sealed, the youth of Detroit can be safe, and the JLA can plan their next move to stop Felix Faust. Steel has managed to get inside the medlab just as the demons' attack causes an explosion that forces the metallic door barricaded shut. In spite of the argument with Aquaman earlier, Steel agrees to do everything to help the tour group of youngsters. While Dale, Elongated Man and Gypsy lead the students to safety, the rest of the league will create a diversion fighting Felix Faust's magical army. Can the JLA defeat their old foe, or will Detroit and the rest of the world face the ultimate wrath of the vicious wizard? Zatanna explains that Felix Faust has the Tablet of Tel El-Amarna. Whoever translates it can gain power over the darkest nature of man as Felix Faust has done. The Justice League must take the ancient scripture away from Faust. In spite of this, Aquaman only wishes to save the school children and leave their foe to the big guns. However, Faust's monsters have broken through the medlab door. The JLA may not be able to prove themselves to the world if they are defeated in this battle that could be the beginning or the end for them. As Felix Faust gloats about his victory to an injured Vibe, Gypsy has run off. The Tablet of Tel El-Amarna is flying toward the evil sorcerer. The stone breaks as it strikes Faust's head. The demons and creatures vanish into thin air. Aquaman and the rest of the Justice League learn that Gypsy had thrown the tablet at Faust to break it. She disobeyed orders, but Aquaman praises her for her quick work to save everyone. Faust is arrested as the boy in the Superman T-shirt approaches the JLA. He introduces himself as Geoff after thanking them for not giving up. The team thanks Geoff for believing in them. Geoff comments, "How could anyone give up on you? You guys are the Justice League." Story - 4: This isn't the Justice League some readers might be used to, but that's the entire point of this one-shot. Unfortunately, I don't recall much about the JLA's time in Detroit beyond reading some of the comics here and there. This book helps a lot in that respect as it is more reader friendly than the 70s DC Retroactive issue. I do wish more had been said about the character of Dale. He pretty much feels like a footnote rather than a character. Whereas Cary Bates' story in the previous outing was sluggish and drawn out in spots, this one is pretty fast paced and holds the readers' interest better in my opinion. Plus it feels like Gerry Conway is having fun revisiting the JLA. The energy just shows with every page. The beauty of this story, and this version of the Justice League for that matter, is that the team is trying to live up to the previous incarnations of the team. Personalities clash, and at times that makes the book feel more like a Marvel title, but this has always been one of Gerry Conway's strengths as a writer. A lot of his work depends on the characters. Felix Faust feels like he belongs in a Conan story. Yet, for some odd reason, he works well as the book's villain. He provides the JLA with the necessary challenge to get the job done. Sure, Superman, Batman and/or Wonder Woman may boost sales of Justice League comics. However, as Geoff points out to the team, it's not who's involved that's important. It's the idea of doing the right thing. Gerry Conway shows us this with a tale that is a pretty solid one. I now want to go and read the issues from this period thanks to this one-shot. Art - 5: Ron Randall's art is downright stupendous and adds to the retro atmosphere of the book. I wish more books had visuals this good. Randall really blew me away with his style. It really helped take me back to the 1980s. 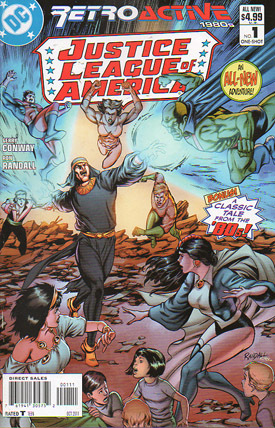 Cover Art - 5: Like DC Retroactive Justice League of America - The 70s, this image makes one forget that it's from 2011. Plus, like the best comic covers, it made me curious about the pages inside. It's just plain amazing.